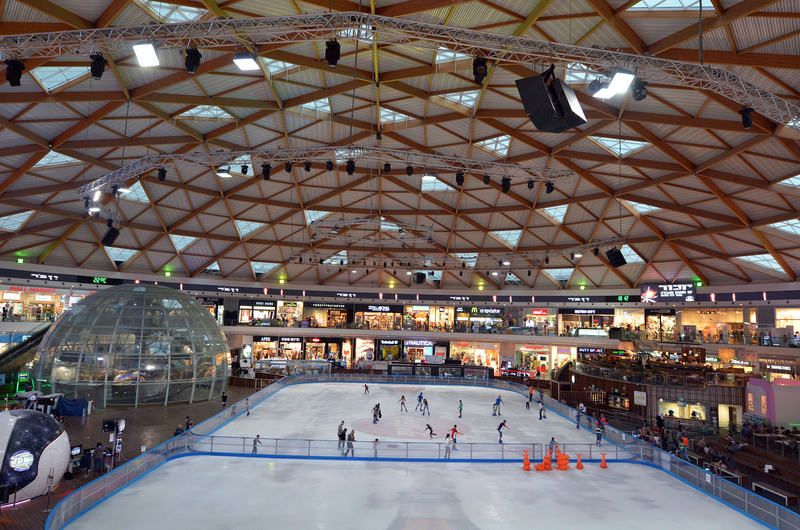 Ice Park & Mall Eilat is the first shopping center of its kind in the world: An enormous dome structure containing dozens of shops and brands names of the best designers from Israel and abroad. The Ice Park is divided into a number of areas: The top floor of the Ice Park Eilat is dedicated to brand stores from different fields: fashion, cosmetics, jewelry and more, to ensure an enjoyable shopping experience and special VAT-free prices. In addition, the upper floor also operates the Artist Market: Handcrafted jewelry, homemade food, house wares, clothing and more. Kids will enjoy the huge two stories high arcade which offers a variety of pinball games, video games, bumper cars, playground for toddlers and many other attractions children will love. On the ground floor, designed for entertainment and recreation, you will find a selection of food courts, cafes, gourmet and fast food restaurants, and the grand attraction- an ice skating rink in the center of the floor. The attraction provides skating lessons and figure skating performances, and in the future, skating competitions and ice hockey games are expected to take place. In addition, the lower floor also has a small theme park built as a glass dome and offering real snow and winter activities for kids in an arctic atmosphere. Ice Park & Mall Eilat offers a one of a kind experience of shopping, entertainment and fun for the whole family.